There are many benefits to a kitchen island. If you have one, you already know how useful it can be as a secondary storage location as well as a secondary prep surface. If you don’t have one, you need to learn about all the benefits. 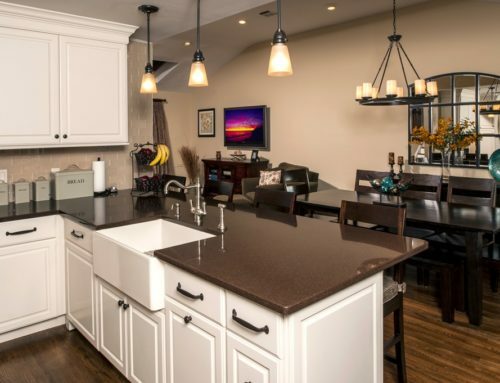 Even if there is already one in your kitchen, it may be underutilized and there may be an opportunity for some remodeling, which is what we can help with at Designers Choice. If your kitchen is large enough to have an island, it is a great way to break up the floor plan so you don’t have so much floor space. The extra advantage to this is that there is less to mop on a weekly basis. The island can be as large as you want it to be as long as you have plenty of room to walk all around it. The island can have a sink within it. Plumbing can be run so you have a fully functional sink with water. The benefit to this is that you can have an additional sink for doing more on a regular basis. If your side by side sinks are loaded with dirty dishes and you need to rinse poultry, defrost meat, or do additional prep, having a sink on the island can be a saving grace. Storage may be at a minimum for you. If you like to have a lot of gadgets but don’t want them crowding your countertops, you can store them within the built-in cabinets and drawers of the island. Even if you already have an island, you can work with our cabinet makers for some customizations so you can convert open space into shelving, cabinets, or drawers based upon what you want to store. Entertaining may be a focus of yours and having some additional countertop space may be just what you need. Larger islands can be used as a makeshift buffet where you can set up the food, invite people into the kitchen to fix a plate, and then make their exit to the dining room, living room, or wherever else you have invited people to eat. 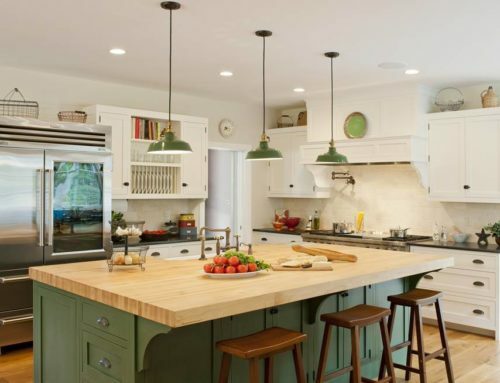 The countertop on top of the island can be the same surface as the rest of the countertops in your kitchen or it is a chance to choose something more unique – such as a colored tile, a reclaimed wood, or something else. Much of it will depend on theme. The kitchen island can have all of the features you need to be a reliable centerpiece for your kitchen. Even appliances can be installed within the unit, such as a dishwasher or mini fridge or even a wine fridge. This allows you to add versatility to your kitchen and improve the flow. Whether you have an island currently or not, there may be untapped benefits that you can explore with Designers Choice. We can provide you with the designs, the installation, and all of the aesthetic improvements you desire. Designer’s Choice is a High-End Kitchen and Bath supplier that serves Condo and Sub-Division Developers, Designers and Residential clients in Canada. We provide Kitchen and Bath fixtures that complement their décor needs.